In this innovative first-person puzzle platformer you field-test the so-called “portal gun” that allows you to open portals on flat surfaces through which you can then move. You do all this on behalf of a mysterious AI that is in charge of the Aperture Science Laboratories ... but what happens to you once all the test are done? Great game, a real puzzle game. Wish VALVe could count to three though. This game is one amazing brain teaser wrapped up in a little amazing bow. Once upon a time in half-life universe, there was a hidden research facility. 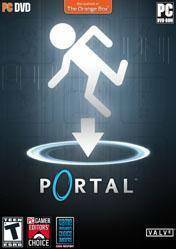 Portal is a great puzzle game. Some levels are easy, some are harder. Glados is a great companion during the game. (spoiler alert) Although she tried to kill you, we all love her. GLaDOS is a legend now. One of the best puzzle games out there. Have You Played… Bridge Constructor Portal?